It seems that my constant refrain is how interesting and historical this valley is and yesterday’s adventure supports that theme. 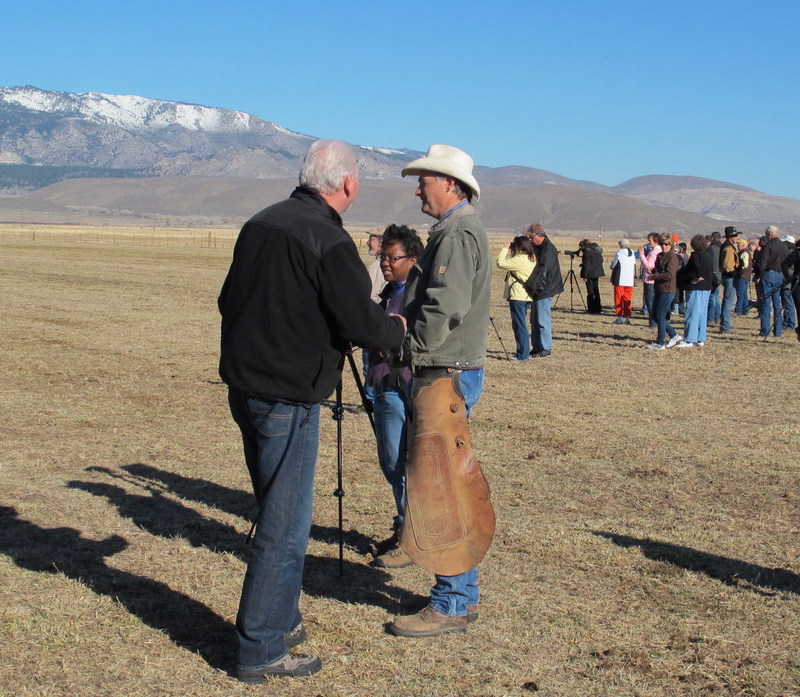 Jerri and I had the awesome opportunity to join a Carson Valley Chamber of Commerce tour of several ranches in our valley to learn about eagle habits, habitat, and their life cycle and the history of agriculture in Carson Valley. 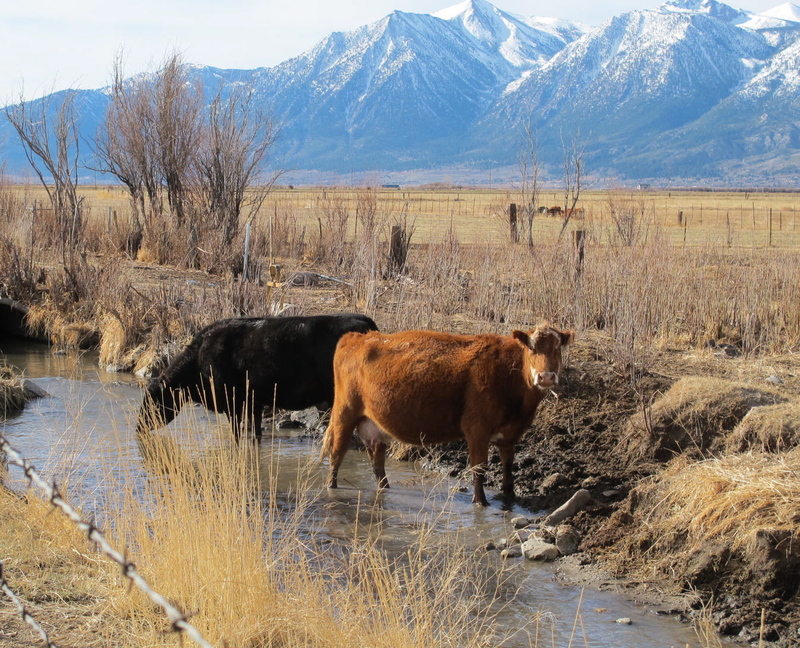 For 12 years, the Chamber has fostered this program is focusing on non-renewable agricultural land and wildlife habitat we lose when we pave over the ranches and farms. My last blog mentioned viewing the birth of a calf and how the cow took care of it along with how the eagles come in to eat the afterbirth. This tour ties into all that. 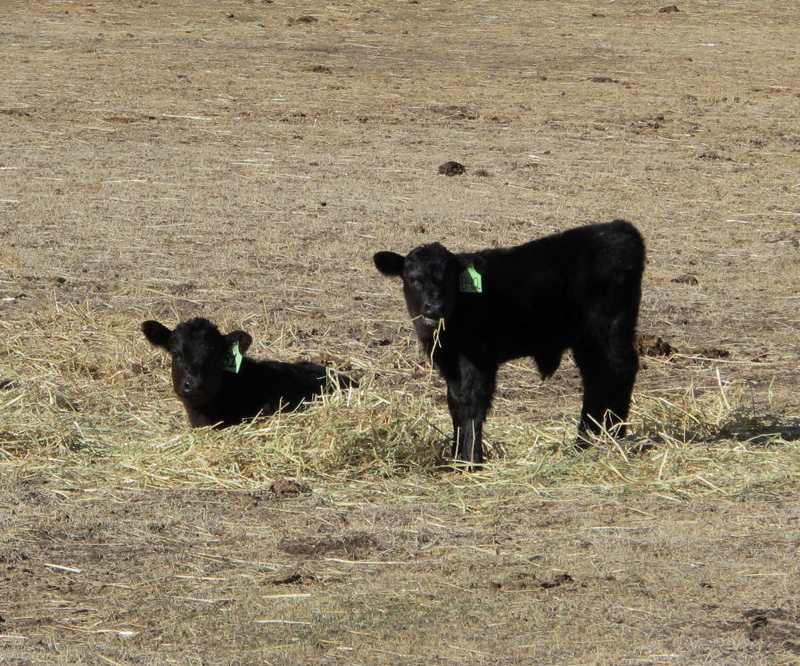 learned about the ranch, its people and the trials and tribulations of working with government regulations, rising costs of raising a calf, coyote kill (at least $1000 down the drain if a coyote kills a calf or if it is stillborn), and the severe drought we are all suffering through. We didn’t get to see any eagles on that ranch because no calves had been born recently. 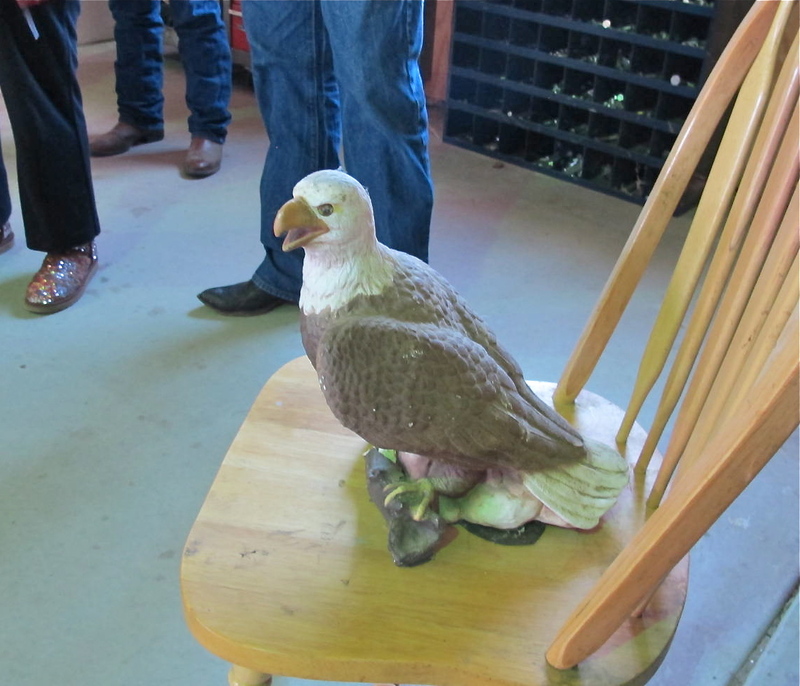 In case we didn’t get to see any eagles that day, Mrs. Mack showed us a small eagle statue that she bought at a garage sale and kept in one of the barns. She told us that a barn owl attacked it and broke off its beak! Don’t mess with a barn owl! We also got to see a DVD of pictures taken on the ranch depicting calf births and eagles eating the afterbirth. 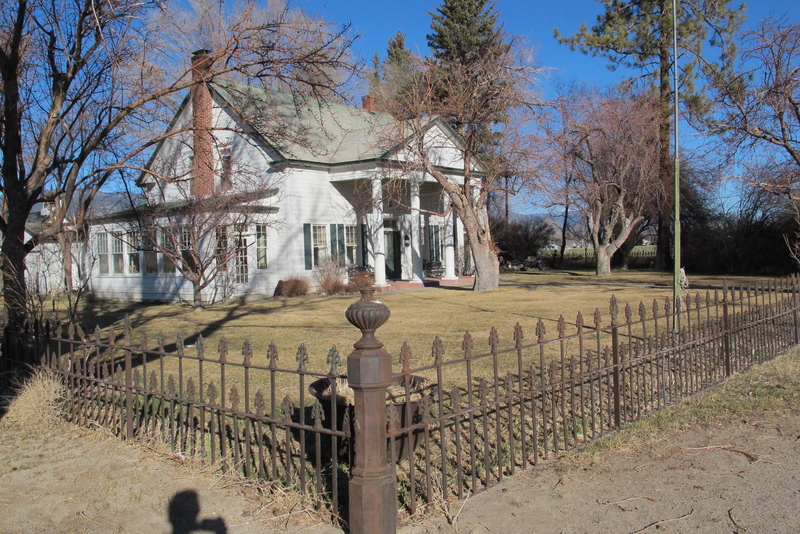 Another historical note about the Mack Land Co. is that the fence around the main house is the original fence that was around the Carson City Mint (now the NV State Museum where Jerri and I volunteer). Mrs. Mack said she didn’t know the story about how the fence got there, but some of her relatives had been mucky mucks in the state government and they probably pulled some strings after the mint was shut down in 1893. Our next venue was at the same place where I saw the calf birth. I learned it is another historical place…just a few miles from my house. 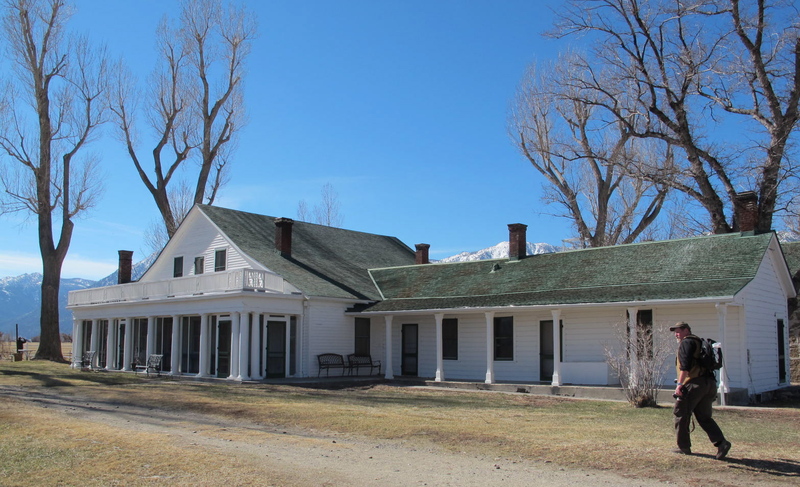 It is the Settlemeyer Ranch, established in 1890. Our host was JamesSettlemeyer, NV state senator and ranch owner. This was a cool place because we got to see 12 eagles! They were more than 100 yards away, so our binoculars and scopes came in handy. The birds were in all stages of development and were scrapping over a dead calf. The birder on our bus told us that it takes 5 years for the bird to become a full-fledged (pun intended) adult. Another interesting fact is that “bald” in old English means white. 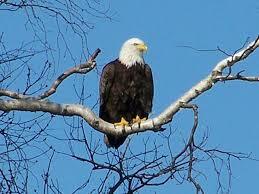 So a bald eagle merely means, white head. The following is my picture of an adult eagle (the little dot in the center of the picture) and the picture after that is what fully equipped photographers got. The Galeppi Ranch, founded in 1864, was our next destination. 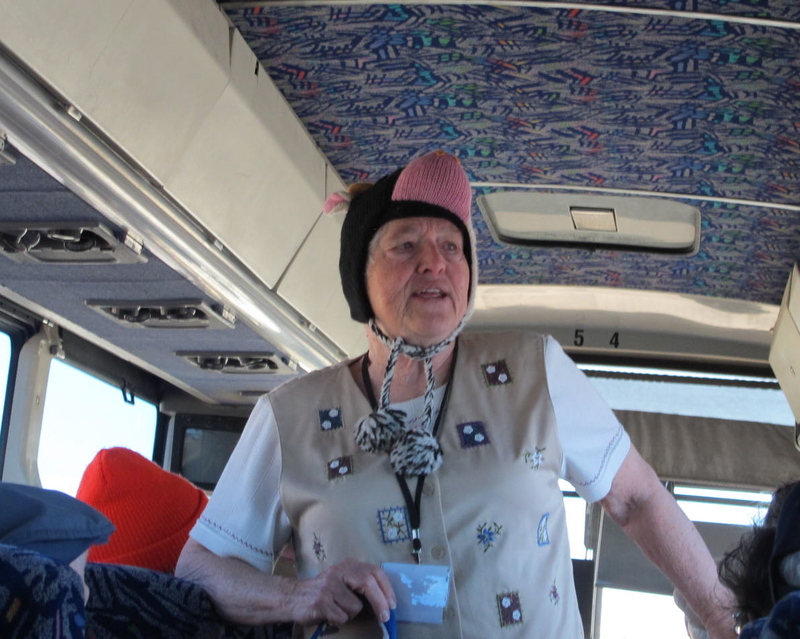 We were met by Barbara Galeppi who wore a cow hat to help us remember her. Quite a character, she was. Her ranch raises registered Herefords, which is why all the cows and even newborn calves have special ear tags. 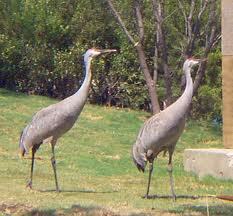 We didn’t see any eagles on the Galeppi Ranch but we did see a pair of sandhill cranes. Bob and I had seen them in Colorado and Florida, but I didn’t know they also spent time in Nevada. Again, they were very far away and if it hadn’t been for our birder friends, Jerri and I never would have spotted them as they blended in with the grey sagebrush. Here is an Internet picture of them. Our fourth stop was at the Nature Conservancy near Genoa. There, we hiked a little way and were able to see a pair of eagles nesting. 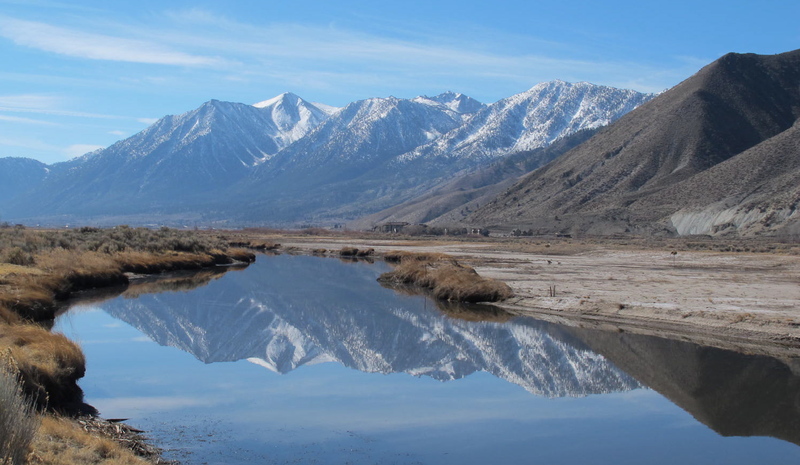 Again, too far away for my camera, but I did get a picture of the Sierra Nevada and Job’s Peak reflected in the Carson River. Our last stop was at the Dangberg Ranch that began as a homestead in 1857. Heinrich Dangberg built a log cabin in the sagebrush and began to build his empire that eventually grew into more than 20,000 acres by the time of his death in 1904. 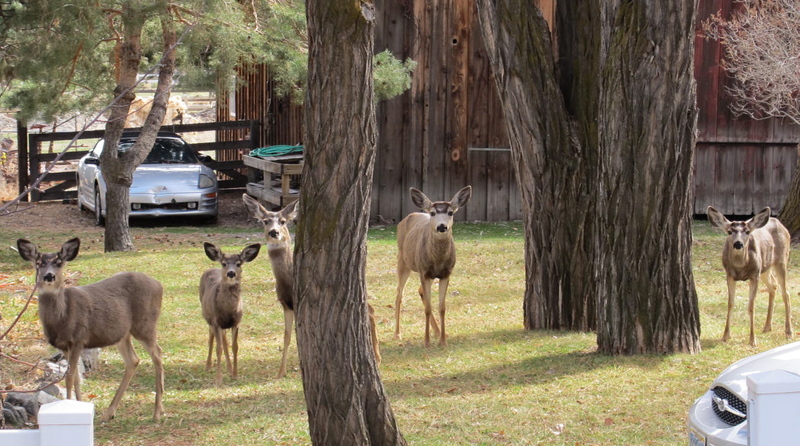 His ranch is now a Douglas County historic park that one can tour. We saw a soaring golden eagle, but no bald eagles there. Jerri and I are going to return to the Dangberg Ranch to spend more time and take a guided tour of the land and the 4,000 square foot ranch house. Quite a difference from his little log cabin. I learned a lot on this adventure about the local history and even more to keep my mouth shut about being a newbie from Southern California. I can relate to the old timers’ angst as I experienced it down south watching the land transform into something that bears little resemblance to what I grew up in. Those of us who grew up in Orange County can’t go home again because it’s not there. How’s that for a bit of sour grapes? I feel a bit guilty moving into this beautiful place, but at least I didn’t destroy any land or build a new house to get here. Perhaps I can assuage some of that guilt by supporting the movement of trying to retain the agriculture that is still here and help people enjoy it as I do. Valentine’s Day, 2014 dawned with a beautiful sunrise, but, of course I didn’t have my camera available on the way home from the gym. Take my word for it, sunrise was beautiful! 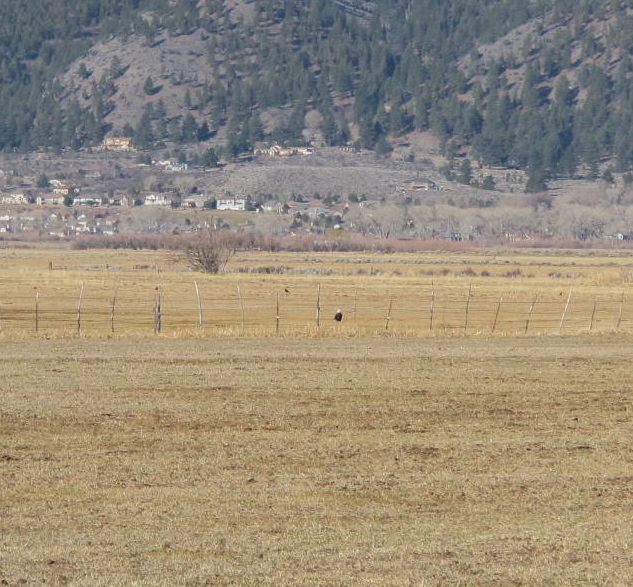 On a whim, I decided to drive a few miles south on Hwy, 395 toward “downtown” Minden (I live in the ‘burbs of Minden) and see if I could spot any eagles in the pastures that line 395. As I might have mentioned to some of you before, they begin to arrive this time of year when the cows give birth to the cute little calves. No, they don’t eat the newborns. They eat the afterbirth that is filled with lots of good nutrients that raptors like to eat. Yea! I spotted a pair of eagles quite a distance away. I only spotted them because I was using binoculars. They were obviously feeding on something, so I assume it was afterbirth, but the cow and newborn were not nearby. The calf below is the same one in the picture above. He had wandered over to the little creek but didn’t go down into it. Maybe he doesn’t drink water yet. I think he’s less than a week old. As I was scanning the pasture for more eagles, I saw a reclining cow and just happened to realize she was giving birth! WOW! As much as I’ve been around animals, I’ve never gotten to see this miracle before. So I watched the entire process. At the end, she stood up, in a move that I suppose makes gravity help with the birth, and the calf just dropped out on its head (I’m not sure it was the head because of the distance in viewing this miracle). So there is truth to the saying that cows drop their babies. 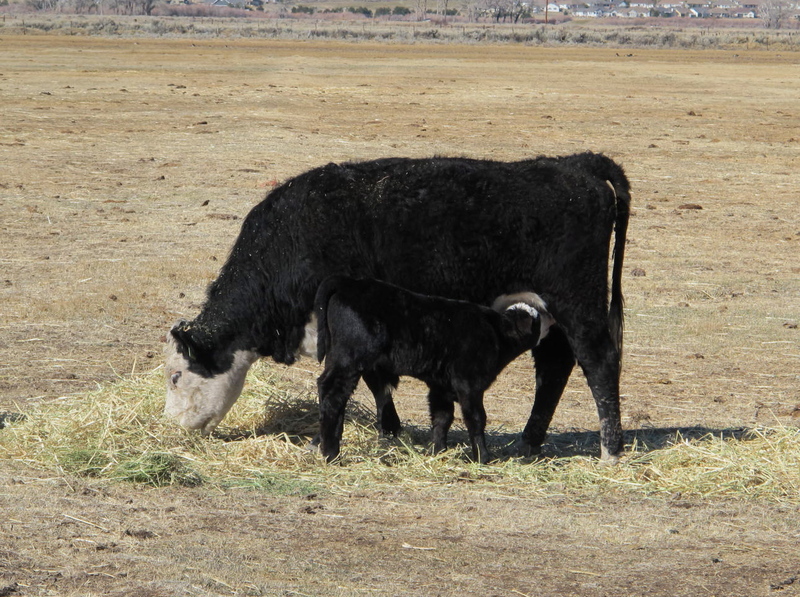 Then I watched the new mother meticulously clean up her calf and begin to nuzzle it. In just a few minutes, it tried to stand up. There were so many tries and I wondered if it would have enough energy to finally make it to all four legs. Oh, I of little faith. In just about 15 minutes, the new baby was getting its first meal from mom. Animals are amazing! I would loved to have gotten pictures of the baby trying to stand up and eat, but, even with the binoculars, the images were pretty small. 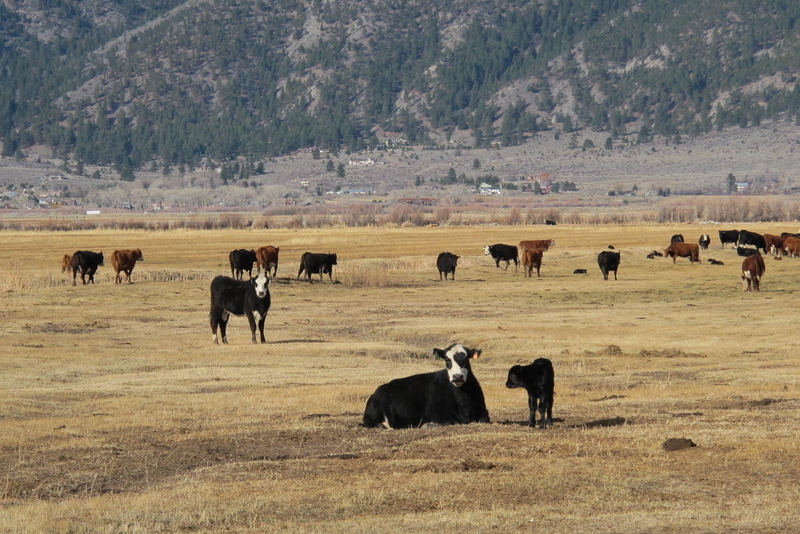 Later, I drove over to Genoa, a small town right at the base of the Sierras in hopes of seeing more cows, calves and eagles. 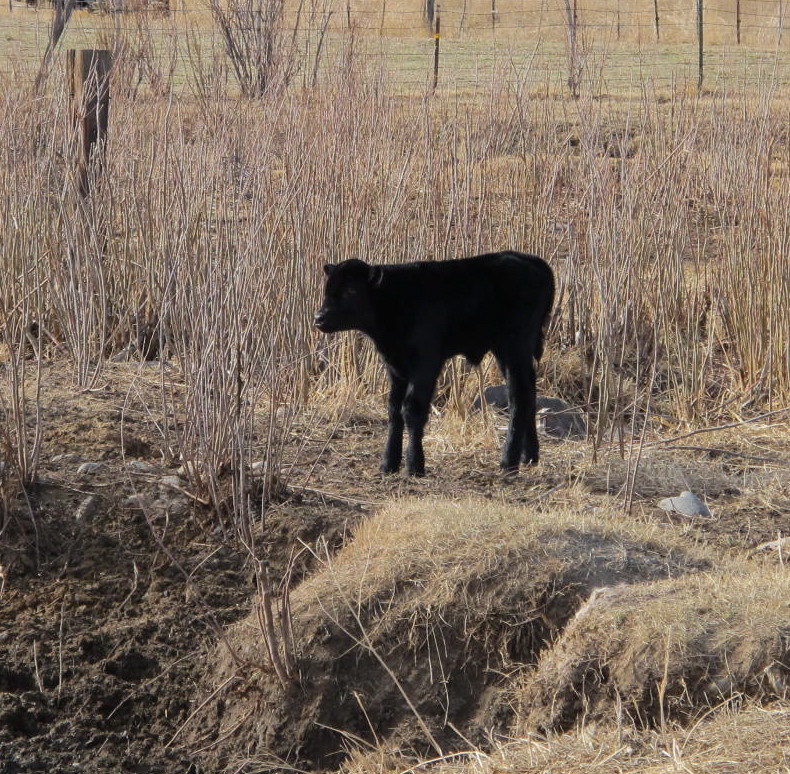 I did see some cattle, but nothing as exciting as what I’d already observed. Genoa (the oldest town in Nevada, if you don’t talk to people from Dayton) is known for antiques, the oldest thirst parlor in Nevada, cute little restaurants and mule deer. Those poor citizens of Genoa never have any flowers in their yards because the deer eat them faster than they can plant them. Here is a small family in somebody’s front yard helping to crop the lawn and fertilize it at the same time. Carson Valley ranchers and the Chamber of Commerce have found a way to bring in tourists and make money with this annual, natural phenomenon of the eagles coming in to get the afterbirth. They organize tours of the ranches, rafting trips down the Carson River, tours to see wetlands and then also photo contests along with expert lectures on this natural happening I think it’s a cool way to introduce people like me to the inner workings of ranches, the eagles and the cattle while keeping the riff raff out of the ranch property and their herds safe. Jerri and I will be taking one of the tours next week and then we’ll understand what’s going on in more detail. Of course, there is the cheapo way that I did today by just driving along the highway and stopping to take pictures.. Many people do this but I think it will be fun to learn more next week and maybe have an opportunity to get some better pictures. Hope to be able to show you more soon.